The Misguided Man CD is meant to be fun… That’s all, just a good time. So don’t take it so seriously, it’s only music. KEEP LISTENING TO THE RADIO because Advice From a Misguided Man can be heard on classical radio stations in Canada, U.S., Asia, Australia, Europe, South America and South Africa as well as SIRIUS XM satellite radio!!!! 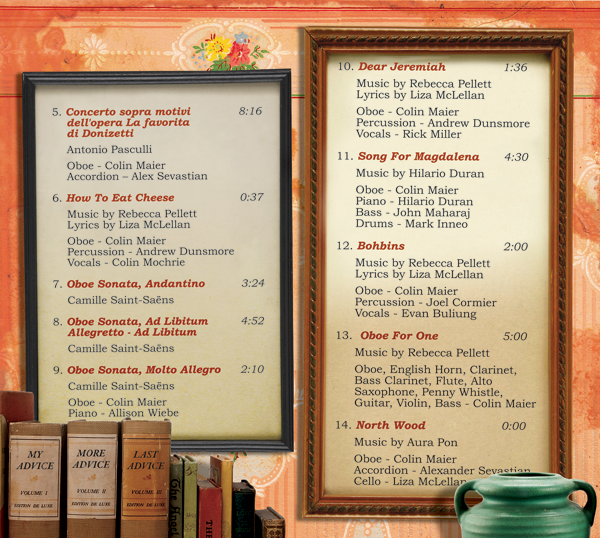 * If you are interested in getting the sheet music for any of this music, it is available! Send me an email. There is also a version of “Songs of the North Woods” available with piano instead of accordion. 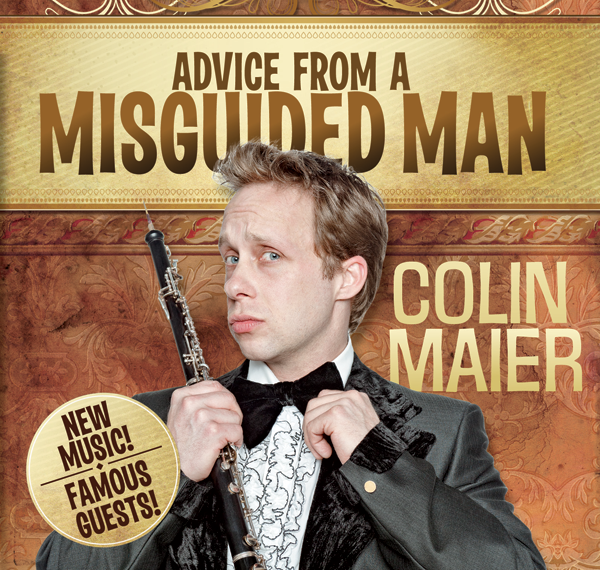 “Advice From a Misguided Man” has the flow of a live concert with a fun and theatrical flair. With the exception of the Saint-Saens Sonata and the Pasculli Concerto, this CD features music that is not “off-the-shelf”. 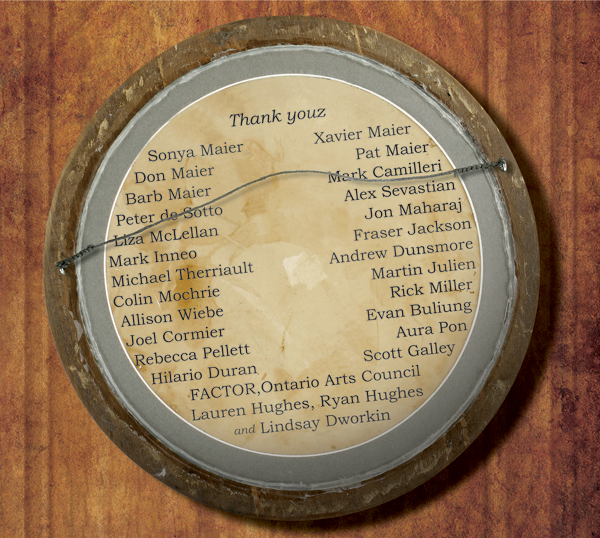 With funding from FACTOR and the Ontario Ats Coundil, I was able to commission pieces from Hilario Duran, Aura Pon and Rebecca Pellett. I have also included two of my own compositions in to the mix. “Advice From a Misguided Man” spans classical, jazz, folk, musical theatre and film style, yet all have the same sense of playfulness. Inspired by Vaughn Williams’ Blake Songs, I set out to create my own grouping of short pieces with a musical theatre twist. I decided on 5 quirky, funny poems by Liza McLellan and had composer Rebecca Pellett set music to them. 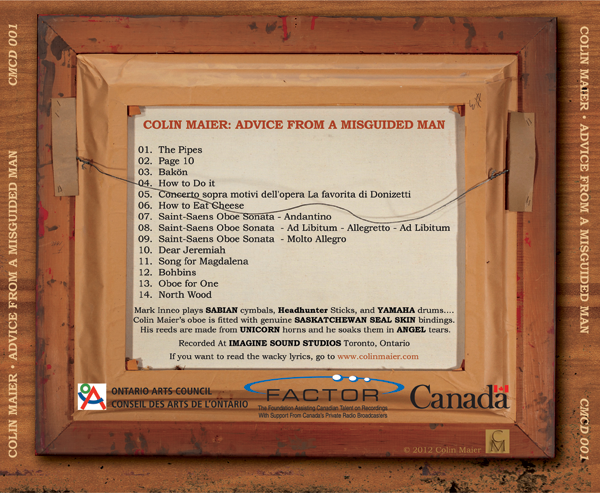 Each poem offers bizarre and random advice, hence the name of the suite and CD itself “Advice From a Misguded Man”. 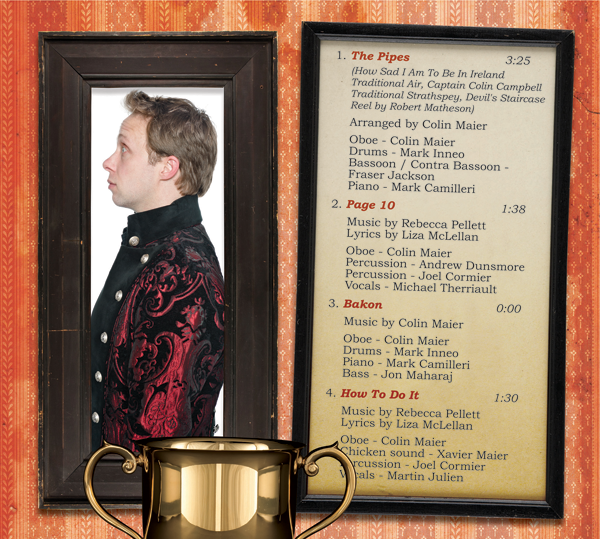 On the CD, each movement is sung by a different Canadian musical theatre star. Rick Miller, Michael Therriault, Evan Buliung, Martin Julien and Canadian comedy icon, Colin Mochrie. These actors have been seen on the biggest stages and have received critical acclaim for their ability to bring truth, passion and humor to the text they deliver. I have interspersed them throughout the CD as a break from the “serious” music and to provide a pallet cleanser for the next song. * For digital downloads go to iTunes or CD BABY. For a physical copy, contact me directly. If its a big book, you still in the Appendix. If its a small book, its the blank page at the end! If its a novel, its the description of the inside of a plane. Well – everyone know what that looks like! Of course you neededededdy to know. Do it and say you did. and then you add a chicken. Make sure the chicken has one right leg and a green thing. and light a skid mark on fire. 5. “Concerto sopra motivi dell’opera La favorita di Donizetti – Antonio Pasculli. Just shove it in your face…YAR! At times like these, what you need to do is get scurvy. Yes, just go and get scurvy and be done with it. Then I shall have my piece of mind. Then I won’t have to deal with your stupid habit of collecting things and sticking them in both our noses. Yeah well, it would be just like you to go and get scurvy. You always got everything anyway. If you want my advice, you should aim for shingles, but we can’t always be choosy, can we? Give my love to mother, send her our straw collection. Those are fresh out, after all. B.B.B.B.Bohbins…I once did something foolish. Yes, it would surprise, you know. what creek. Just say you never heard. You don’t know. Better yet – you never knew me. I don’t exist to you. Yeah… yeah, that’s probably not a good idea. (preferably downhill for a quick getaway). and be careful to keep your hands concealed at all times. Remember: Don’t say it was me. 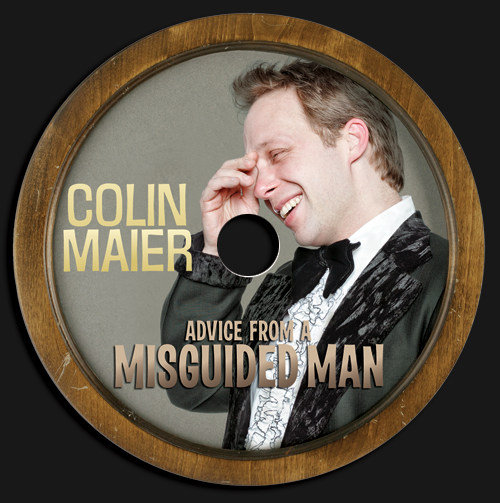 “Advice From a Misguided Man” was produced by Colin Maier. 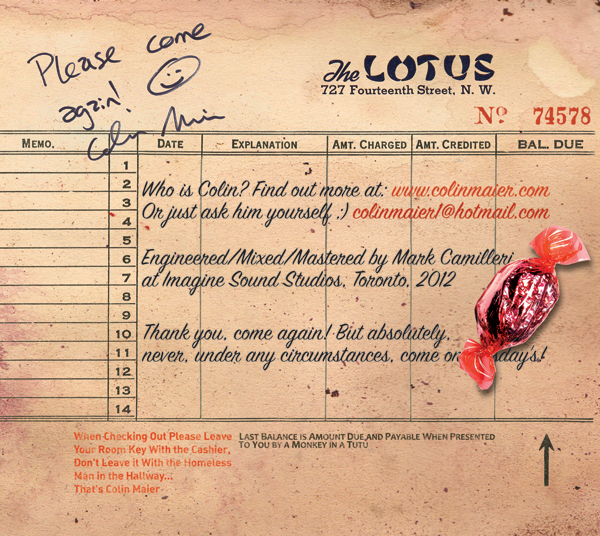 Recorded, mixed and mastered at www.imaginesoundstudios.com by Mark Camilleri.